The direction of the force depends on the positive or negative charges on the bodies. If the two charges are identical, the force is a repulsive force. If one is positive and the other negative, the force is an attractive force. This Coulomb force example problem shows how to use this equation to find the number of electrons transferred between two bodies to generate a set amount of force over a short distance. Two neutrally charged bodies are separated by 1 cm. Electrons are removed from one body and placed on the second body until a force of 1×10-6 N is generated between them. How many electrons were transferred between the bodies? First, draw a diagram of the problem. Start with the Coulomb’s Law equation. 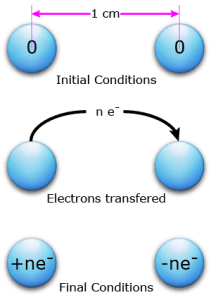 As an electron is transferred from body 1 to body 2, body 1 becomes positive and body two becomes negative by the charge of one electron. Once the final desired force is reached, n electrons have been transferred. We want the number of electrons, so solve the equation for n.
Substitute in the known values. Remember to convert 1 cm to 0.01 m to keep the units consistent. 6.59×108 electrons were transferred between the two bodies to produce an attractive force of 1×10-6 Newtons. For another Coulomb force example problem, check out Coulomb’s Law Example Problem.